Young Automotive Group is a car dealership company. They currently own nine dealerships along the Wasatch Front. They are praised for having excellent customer service and customer satisfaction vehicles. 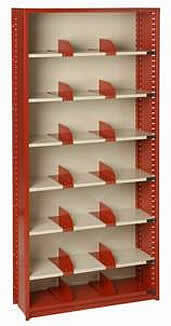 Young Automotive Group needed a shelving unit that was designed to hold and organize small parts. Borroughs Flexi-Bins are designed to hold small parts for inventory departments therefore providing Young Automotive Group with exactly what they were looking for. The Feature: Flexi-Bins design makes it quick and easy to snap a bin onto the shelving unit and give immediate storage. The Advantage: Flexi-Bins are small and sturdy allowing multiple bins to be added to the unit at once. Return on Investment: To add multiple bins onto the unit simply snap a bin on the unit and you have immediate access. Burroughs Flexi-Bins are a great way to organize and store small parts. Flexi-Bins are designed to hold small inventory parts and organize them and maximizing workspace. The bins are sturdy enough to hold a mezzanine and are easily adjustable. The bins can be adjusted in 1-1/2 inch increments. The bins sit on a shelving unit that allows the bins as well as additional shelves to slide on and adjust to meet customer needs. extremely sturdy that they can support a second level. No tools are required for the re-configuring of the unit/shelves. This unit is ideal for customers who work in an environment that work with small parts. Give NationWide Shelving a call to find your perfect Flexi-Bin unit at no extra cost! 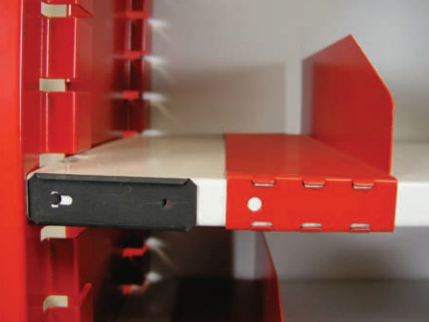 Some options that are offered with the purchase of the shelving unit is to get a Sliding Shelf Divider with built in label holders. This feature creates shelf compartments that are sized to fit your parts inside of them. They are also patented with built in label holders. Slide-in Shelf, Sliding Shelf Dividers, Drawers, Label Holders, trim panels, and Bin drawers are also other options that are available to customers interested in purchasing the Flexi-Bins shelving unit. Flexi-Bins are ideal for customers that work with car parts, computer parts, sewing parts, and any other type of environment that handles small parts. They have an easy installation and customers can purchase additional shelving and bins rather than buying an entire new unit.